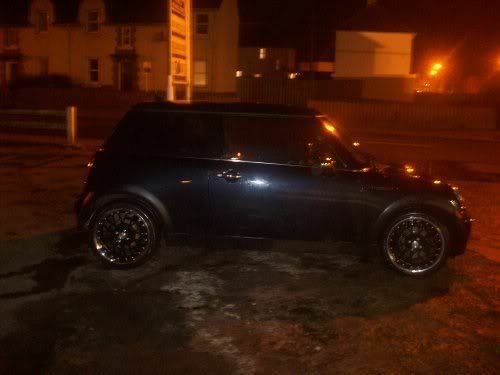 My wee MINI, needs lowered bt thats next on the list! feelin it! will look amazing when you drop it! join team slammed!! Thought about Aero kitting it but I'm not sureeee, get it lowered next, then Cooper S spoiler, then exhaust system probably! sounds like its gona be a belter of a car!! keep us updated on it! Like as standard with small side skirts etc ? Yeah it does, u can get the arches n skirts n that painted, looks quite gd but can start 2 peel as far as I kno cos its on plastic...haven't made up my mind what am gona do with regards to the kit yet, but I'll keep u posted, try n get some more pics up aswell! gd gd sounds like a nice project to me too keep us updated whos doin ur work? very nice mini! rims look mint too! But nice mini! And I have seen it about! Lmao stop violating my wee Lola's post! So what sort of power you get from your Mini as in whats the BHP ? Lol bhp's gash, somewhere in the 90s, should be gettin a wee boost soon tho!